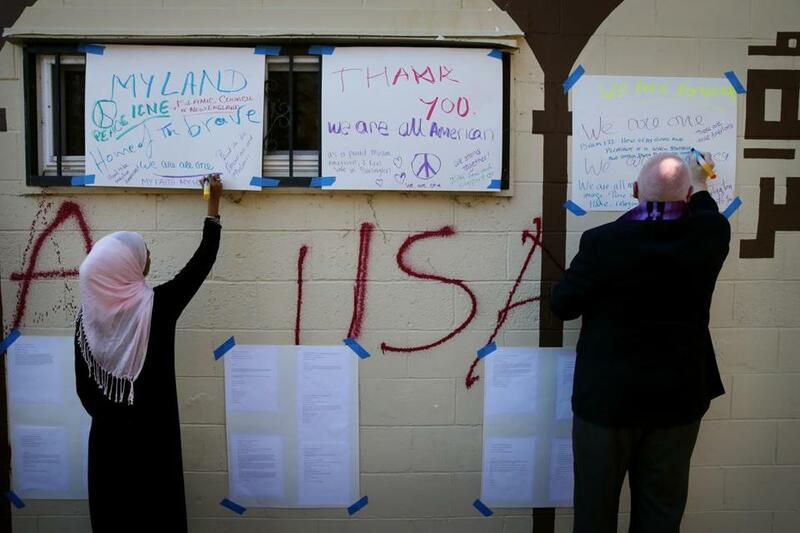 Fajila Khalifa, a member of the Islamic Center of Burlington, and Michael O’Brien, interim pastor at Presbyterian Church in Burlington, wrote positive messages on the mosque’s wall in November after it was vandalized. In 1979, when I was a child, the Michigan community center that my father and great-grandmother founded to help Arab immigrants was gutted by fire. Investigation found that the center was targeted by racists. With the help of community residents — white, Latino, and black as well as Arab — we rebuilt. A few years later, our new community center was also burned to the ground. Again the larger community — immigrants and natives, auto workers and grandmothers — came together to help. But the bigots’ message was clear: Muslims are not welcome here. It was easy to see where the bigots were getting their inspiration. Their hate reflected what I saw in the culture around me. In film, on TV, and in newspapers, images of Muslims were uniformly negative. Oil sheiks battling the Bionic Woman. Terrorists blown away by Chuck Norris. Monstrous caricatures of the Ayatollah Khomeini and Moammar Khadafy, who, our schoolteachers told us, wanted all Americans dead. Years later I was living in New York when terrorists flew airplanes into the World Trade Center, murdering thousands of people. Public spaces were wreathed in notes of support from across the country. Most were solemn and gracious. But there were others. “They had their turn. Now we’ll get ours!’’ screamed one banner, though we didn’t yet know who “they” were. Another poster showed a man in fatigues stomping on a camel. This knee-jerk reaction found its expression in the streets as well. In New York and across the country, mosques and community centers were vandalized. Muslims — and those who “looked like” Muslims — were harassed, even attacked, simply for going about their lives. 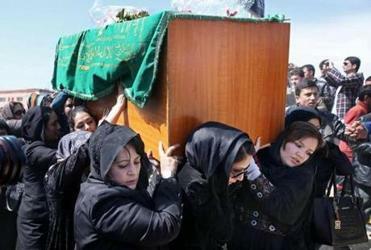 The horrific lynching of an Afghan woman falsely accused of burning the Koran perfectly illustrates the desperate need. Read: Saadia Ahmad: I’m a Muslim — ask me about Islam. Of late, the bigots’ shouts have grown louder. Muslim-bashing in this country has reached a fever pitch. None of the hate I’ve seen over the past decades has prepared me for the vicious tenor of the past few months. Donald Trump’s proposal to register all Muslim Americans in a government database passes for debatable policy. Demonstrators with semiautomatic rifles surround mosques, ‘‘protesting’’ the very existence of Muslim Americans. Those whose children carry last names like mine fear for the future. Pundits say Trump won’t win a general election, but pundits are often wrong. Regardless, the discourse that his campaign has grafted onto — a discourse fueled by a well-funded network of professional Islamophobes — has proven remarkably effective in pushing the unthinkable into the mainstream. We can emerge from this darkness, but only by vigorously, defiantly affirming one another’s humanity. According to Islam, God is ‘‘al-Rahim’’ — the most merciful. I believe in God’s mercy. But whether or not one shares that belief, we can choose, together, to believe in redemption. In human decency. We can save our soul — whether we take that term to mean our character as a nation, or something more mystical — but we must do it together. How? By not staying uncomfortably silent when one’s relatives or coworkers start carrying on about “the Muslims.’’ By asking a proprietor to change the channel when an in-store TV blares pundits preaching hate. By finding out what your kids are being taught about Muslims at school. By contributing to a rebuilding fund for a mosque struck by vandals. These things take time and energy. They can make us uncomfortable. But far more costly is the collective choice — through assent or silence — to become comfortable with this religious and racial hatred. We’ve seen where that dark road leads. It is not too late for us, together, to choose a different path.